LEFT: Celery vase with nine bullseyes in each of five rows. 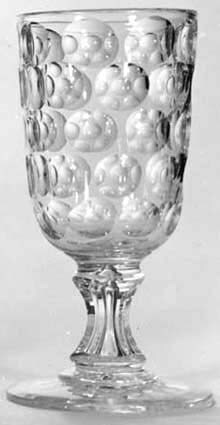 Waisted stem with air trap, fluted. 16-pt star on foot. Mid-nineteenth century. H = 8.76″ (22.2 cm), rim D = 4″ (10.2 cm), foot D = 4.5″ (11.4 cm), wt = 2.0 lb (0.9 kg). Sold for $75 in 1986. 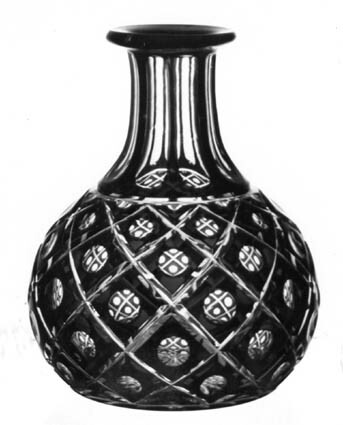 RIGHT: A black-and-white photograph of a red cut-to-clear carafe. Mitered lattice with centrally placed bullseyes and a fluted neck. 16-pt star on base. Mid-nineteenth century. H = 6″ (15.2 cm), W = 5″ (12.7 cm), wt = 1.5 lb (0.7 kg). Sold for $125 in 1988. The term bullseye is used by Pearson in his ENCYCLOPEDIA. It is a convenient, umbrella-type word, covering the great variety of terms that have been used to describe this motif. These include almond, olive, hollow, and thumbprint or thumbmark. One glass term that is not a synonym for bullseye is prunt (pruntie). This is “a blob of molten glass applied to the surface of [a] hot vessel” (Wilson 1994, p. 50) and has no relevance in cut glass. Yet one sometimes hears it mentioned in cut-glass circles (pun intended). Oddly, Mary Boydell uses the word pruntie incorrectly — “circles known as ‘prunties'” — in her introduction to Irish glass, but this could be a typographical error (Boydell 1976, fig. 32). LEFT: Celery vase with columns of bullseyes separated by patches of medium diamonds. Scalloped rim. Waisted stem with air trap, fluted. 16-pt star on foot. Mid-nineteenth century. H = 10.25″ (26.0 cm), foot D = 5.0″ (12.7 cm), wt = 3.0 lb (1.4 kg). Sold for $125 in 1986. RIGHT: Covered sugar bowl cut in a pattern that pressed-glass collectors sometimes call “Spiked Argus” (bullseyes linked by vertical miter cuts). 16-pt star on foot. Mid-nineteenth century. H = 9.25″ (23.4 cm), max D = 5″ (12.7 cm), wt = 3 lb (1.4 kg). Sold for $125 in 1990. 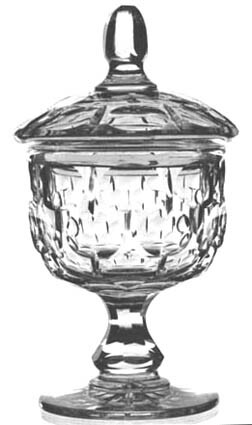 Decanter cut with three rows of bullseyes (thumbprints) on body, short flutes on shoulder, and hollow hexagons on neck. Original stopper, containing air trap, and cut in hollow hexagons. 16-pt star on base. Mid-nineteenth century. H = 12″ (30.5 cm), max D = 6″ (15.2 cm), wt = 2.25 lb (1.0 kg). Sold for $70 in 1988.